Taurus Car Club of America : Ford Taurus Forum > Taurus and Sable General Discussion > Taurus and Sable General Discussion > Not sure with catalytic converter is bank 2 for 2007 Ford Taurus. 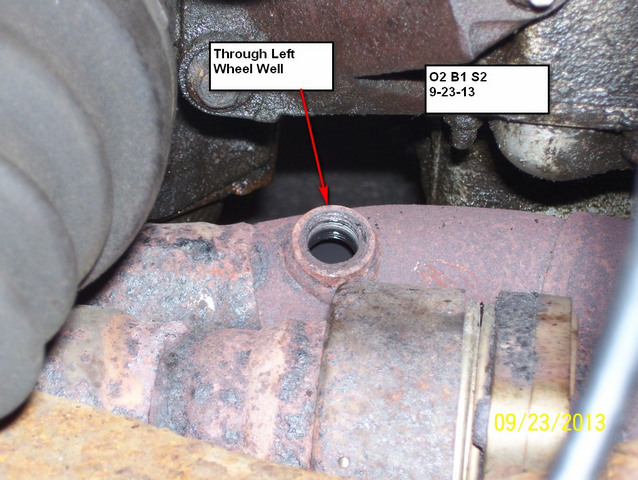 Not sure with catalytic converter is bank 2 for 2007 Ford Taurus. Where is the catalytic converter bank 2 on a 2007 Ford Taurus 3.0 OHV, front or back? Bank#2 is the front (radiator) bank. So would sensor 2, bank 2 be right after the 1st catalytic converter? Pic for G4 of mine. Hope this helps. Not very difficult location if you have the ability to remove the wheel and fender liner. Sensor#2, bank#2 is the downstream (post-cat) o2 sensor for the front bank. Last edited by sheila; 04-16-2019 at 01:46 PM. Pre cat electrical connectors are green, post cat connectors are blue.